Behold! 6 New Parking Spaces! There's a popular metaphor in meeting-speak for topics put on hold for discussion at a later time: the parking lot. Since our inception, the Dill Pickle has only had a metaphorical parking lot...until today, thanks to the investment of our amazing co-op owners! Construction just finished on our tidy little six-space covered parking area immediately behind the store, off the alley that connects Kimball to the Spaulding cul de sac. Additional bike racks are available in the parking area too, right by our back receiving door. We're so excited to have built a store more easily accessible by train, bus, bike and car and we couldn't have done it without equity from more than 2,000 co-op owners and loans from more than 200 of those owners. Though we're putting the finishing touches on our construction project, we still need owner investment to shore up the remainder of our working capital. To date we're raised over $1,000,000 in loans from Dill Pickle owners. We have just $118,000 left to raise to meet our working capital needs. Help us keep this beautiful new store strong and growing by making an owner loan today. To learn more, visit dillpickle.coop/ownerloans. And thank you! Today we passed health, fire and business affairs inspections and can announce the news: our new store at 2746 N Milwaukee Ave will open next Thursday, September 7 at 11am. Join us for a ribbon-cutting ceremony at 10:45am; BYO scissors! We have so much to do in the next week to prepare for opening and there's one big way you can help: buying out our inventory at the Fullerton location over the next three days, when we'll be running deep discounts across the whole store. We'll close our doors at 3039 W. Fullerton at 5pm on Sunday, September 3rd. We're so grateful to our owners and all of our neighbors who've made the Dill Pickle a success, proving that a co-op in Chicago can thrive and grow. The Fullerton store will remain a cherished part of our history and we're beyond excited for the new chapter of cooperative growth and community building. We’re less than a month away from opening our new store and there’s more simultaneous activity than is possible to describe in one short paragraph. All equipment and shelving has arrived and subcontractors are working like mad to finish up tile work, trim, paint, fixtures, moulding, etc, etc, etc by the end of the month. Starting Monday, staff will, with help from National Co-op Grocers, set up shelves while around us refrigerators will be hooked up and tested, signs installed in the windows, and the back wall comes down, opening up our parking and receiving area. But we’re probably most excited about the thirty wonderful folks joining the Dill Pickle staff. Our July 31 hiring fair was successful beyond our dreams, thanks to partnership with and tremendous support from Center for Changing Lives. We screened and interviewed more than 150 applicants and, from that day, filled almost all open positions. We’re deeply humbled by the turnout of good people who want to work for the co-op, people passionate about serving their neighbors and making the world a better place. And we’re excited for our growing, deepening relationship with CCL, who will provide anti-oppressive leadership training for our managers and supervisors, along with ongoing coaching for all staff. Thank you, all our owners and customers for making this good work possible. And remember, we are still in need of owner loans for working capital that will keep our store running through the first months in our new location. Please consider keeping this vision moving forward by making an owner loan. Learn more at dillpickle.coop/owner-loan-program. Beautiful day to paint an awning! We're on track to open in early September at Milwaukee & Spaulding! Check out these four new checkout lanes that just arrived at the new site! You may have noticed some changes to the outside of 2746 N. Milwaukee this week; storefront frames installed, a dip in the sidewalk fixed and replaced with a small ramp to where a new vestibule will sit. Today, inspectors examine our plumbing rough in, after which the snaking systems of pipes and conduit and wire that make up the complex innards of our new store will be sealed away behind slabs of drywall. Those attending our Pickle Preview construction tour this Sunday will see hints of finishes: floor tile in this room, painted ceilings there, and a sumptuous rust red epoxy coating the back of house floors. Walk in coolers will be installed and the dimension of rooms—prep rooms, restrooms, office space, kitchen—will be concrete, so to speak. I hope you’ll stop by this Sunday any time between 1 and 3pm to take a tour of the work and learn how you can help make the co-op opening in September a resounding success! Up until a few weeks ago, the monumental nature of the Dill Pickle’s relocation project was measurable in blueprints, in ledgers, in hours of meetings and, less tangibly (but more powerfully) in the hearts and minds of a couple thousand Chicagoans who believe cooperation can change their neighborhood for the better. Now all that imagining and head-scratching and fundraising and redrafting and more fundraising* is made manifest in steel and concrete. This week hundreds of feet of conduit, ducts and plumbing lines were hung from the ceiling of the first floor and the basement. 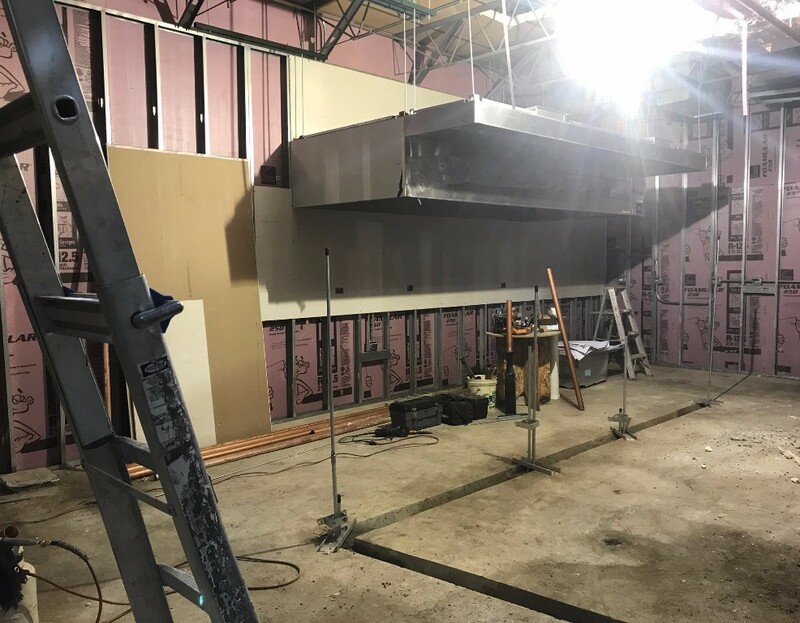 A truly majestic ventilation hood now hangs over where our future deli cook line will be. I can’t speak for the visitors who toured the future home of the co-op a couple weeks ago at our Pickle Preview, but I’m continually awed at the scope of what we’re putting together here. And of course the physical rig is but one facet of the Dill Pickle gem; we’re planning hiring fairs, posting for new positions and spending a lot of time talking about how all our roles will grow and change with the physical store. I hope you’ll come in to take a peek at the construction progress, ask lot of questions and hear tales of your staff and board’s expansion trials and triumphs at our next Pickle Preview Sunday, July 23rd from 1-3pm. *And more fundraising! Help keep our project on track by investing in our owner loan program. For a few hours on Wednesday, the side wall of 2746 N. Milwaukee disappeared, flooding our new store site with light and a view of the Blue Line entrance. It gave us a little taste of the brightness and energy that will soon fill what is, for the moment, a pretty raw construction site. We'll keep providing photos here each week, and we hope you'll come take a look at our progress yourself at our next Pickle Preview, Sunday, July 22nd from 2-4pm. We hosted around 35 owners and neighbors for construction tours of 2746 N Milwaukee Ave during last weekend's Pickle Preview-- thanks to all who came out! Stay tuned for future tour dates in July as work continues to progress. We're on track to open at the end of summertime! Pickle Preview: Sneak a Peek Inside our New Store! Join us this Sunday, June 11 from 2-4pm at 2746 N Milwaukee Ave to check out the progress we've made together and learn how you can support our success.Construction tours will be led by the GM at 2:15, 2:45, 3:15, and 3:45pm. This week at the site: conduit is up, HVAC ductwork is hung, and roofing work is underway! Next up: drywall.